The Legend of Zelda Link's Awakening DX Game Boy Color Game Cartridge Cleaned, Tested, and Guaranteed to Work! This title is essentially a pocket "Link to the Past." I found this game to be charming and quite large (at least on Gameboy). A must-buy. The game is in great condition! Looks like new, also the customer service is super efficient and kind, thanks! Way up there on my list of favourite games! If you like other Zelda games, you'll definitely like this one too. One of my favorite Zelda games! The story is brilliant, gameplay has a nice balance between puzzle solving and combat, and the soundtrack is amazing! 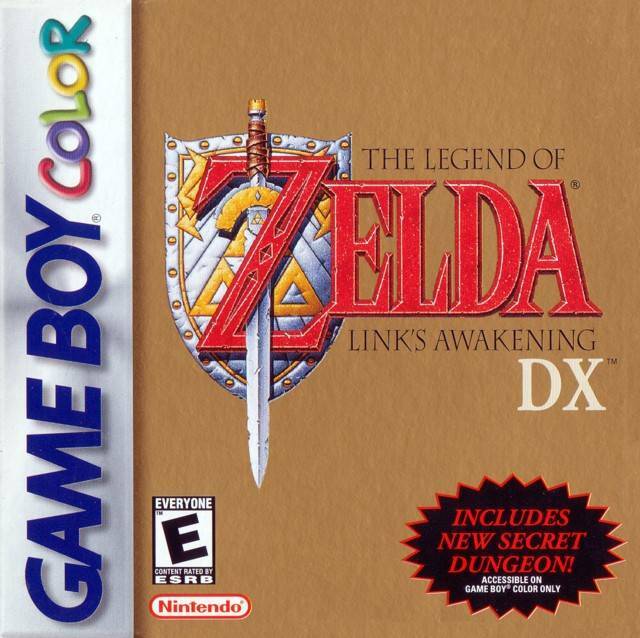 Any Zelda fan should get this game as well as anyone with a GameBoy original or GameBoy Color! I have not played this as much as some of the other games i have/bought, but what i have experienced out of this game so far is perfect and without any issues at all! The Zelda series has taken many different turns since the early 90s when the original Link's Awakening was released, some for the better and some for the worst, but Link's Awakening is still just as well put together, fun to play and wickedly entertaining today as it was in the 1990s. The game's gameplay is action-packed and puzzle driven giving an excellent balance between the two Zelda staples. The most charming thing about this game is undoubtedly the variety of characters that you encounter on the island. The island is chock full of interesting and fun characters who are constantly providing the player with side quests and interesting tidbits of information that drive the plot. The game's soundtrack is also above average for a handheld game. The recognizable Zelda theme returns, but there is also a plethora of well thought out original music for this one. Each boss fight in the game is incredibly well thought out (Despite the fact that some are recycled from Link To The Past) and incredibly fun to fight. My own quarrel with this game is that it is a little bit too easy and a lot of the quests are self-explanatory and don't require a lot of thought. Overall, play this game. Even if you're not a Zelda fan, it's still an incredible title with oodles of potential. This was my first Zelda game and after all these years, it's still my favorite! Usually, game boy games from this era are watered down ports of their larger cousins, but not this one. This is a full Zelda game with challenging dungeons, lots of secrets to find and fun action. The DX isn't just there for the color enhancement either. There's a whole new extra dungeon, too! If you like Zelda games, or if you want a game to get you introduced properly to the series, Link's Awakening DX is the one for you! I played the original back in 1995, a few years after it came out. Then some years later when I got a Game Boy Color I learned of this DX version. This, friends, is the right way to remake a game. Add enough new content to make it worth paying for, but keep the spirit of the original alive. Why Nintendo forgot this importannt strategy when they destroyed their attempted remake of Crystalis for the NES I'll never understand. Link's Awakening DX follows the same unusual story of its Game Boy counterpart. Link becomes shipwrecked on a mysterious island called Koholint and subsequently learns that in order to leave he must collect eight enchanted instruments and use them to awaken a mysterious entity known as the Wind Fish. But it would not be a Zelda game without a villain out to prevent the completion of this quest. Instead of Ganon (originally spelled Gannon), Link must contend with a series of creatures called Nightmares, each of whom guards one of the eight instruments. This version, however, features a bonus dungeon as well as a picture sidequest that allows the use of the Game Boy Camera accessory. One ting the Zelda franchise has always been known for is its excellent music. Link's Awakening is no exception. You'llhear remixed versionsof some of your favorite tunes (not the least being the clasic Zelda overworld theme and the item acquisition theme and yes even the little secret discovery tune), but there's also a fair variety of new tunes. Unlike the rest of the Zelda games from that time, Link's Awakening features a unique theme for each of the dungeons Link must traverse. 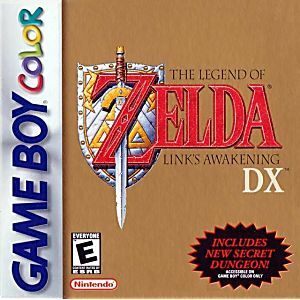 The DX version even features a well-done remix of the classic dungeon theme from the original Legend of Zelda, though you won't hear that unless you decide to tackle the optional bonus dungeon. So all in all this is a remake well worth having, even if you own the original Game Boy version. Link's Awakening is a blast. It combines the classic 2d Zelda formula with a hilarious and sometimes random sense of humor. You'll find yourself fighting epic battles, while hunting down the strangest things...like dog food! The game is quite difficult compared to many other 2d Zelda games though. Sometimes the randomness will make it difficult to understand what you're supposed to do next. However, figuring out each puzzle is very rewarding, and the level of fun far outshines any frustration. If you love Zelda, this is a must have. This game is simply awesome. A classic Zelda game full of puzzles, side quests, and items. Many dungeons and lots to explore. The DX version also has a bonus dungeon. Different story from common Zelda games but still great! Full of great gameplay with quirks and humor thrown in. A must for Zelda fans. OK the graphics are not up to 2010 standards I'll give you that. But I'd say the majority of you who disagree never played this. #2 in my opinion is Link To The Past for the Super NES (although the Game Boy Advance clone is better, but it's pretty much the same game). Oh the hate mail I'm going to get for this review. Zelda fans love hate mail.